Andy Ricker has become famous in the USA cooking up Thai dishes from the North of Thailand and Southeast Asia for his Pok Pok restaurants in both Portland, Oregon and NYC. Check out a handful of his recipes on our site and you can also get the ingredients and cookware here! Andy Ricker’s long awaited Pok Pok Cookbook available today! Chef Andy Ricker doesn’t know whether to celebrate or cry as his Pok Pok cookbook rises to the top of the Amazon best seller list (even before the shipping date)! 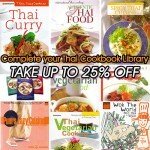 See some of the Thai recipes and get the hard-to-find ingredients here. The weird and the wonderful bombard your senses at even the most pedestrian of Thai markets. There always seems to be something new to delight the taste buds and provide a bit of a sense of adventure. In this fourth installment of my visits to the local Thai market, I share with you some of the dried spices, sauces and strange foods to be found. We are proud to introduce our first How to Cook Video featuring one of the most popular recipes in our Thai recipe collection – Green Curry! Follow our authentic recipe with simple step-by-step instructions.